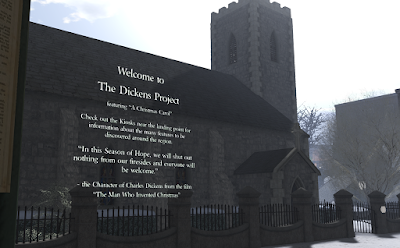 SUNDAY, December 30th beginning at 1pm: FINAL DAY of The Dickens Project! 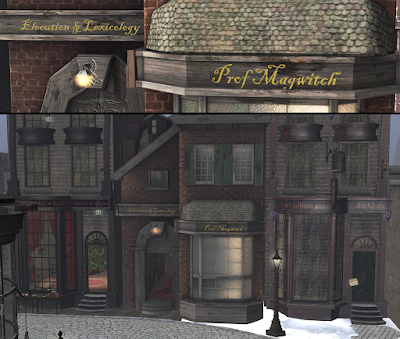 The time has come to say good-bye, for now, to the most magical edition of The Dickens Project SL yet! Our view goes forward today: facing the potential of a waxing new year, as well as celebrating the achievements of the waning. From 1-2pm : STORIES - Maeve Binchy's short stories "A Cure for Sleeplessness" and "One Night A Year" with Aoife Lorefield and Caledonia Skytower, live in SL Voice. SATURDAY, December 29th, 2pm at The Dickens Project: EVEN MORE GHOST STORIES! Staying the night in a rather sinister old dâk-bungalow, a man hears the 'unmistakable' sound of a game of billiards being played in the non-existent room next door - a strange game in India at the time of the Empire. A man does his friend a favor, and comes to regret it. An unusual gothic horror story, written in 1912 and set in the sunlight rather than the dark and taking place on the day before Christmas. A tale of looking back and the healing power of Christmas. A prime example of the British tradition of Christmas ghost stories. A medium gets more than he bargained for. Presented live in voice, in Dickens Square. FRIDAY, December 28th, 2pm at The Dickens Project: MORE GHOST STORIES! We continue down our in-between-the-holidays path today with a return to Dickens, but not the Dickens most people think of - especially not at this time of year. The Signal-Man was first published as part of the "Mugby Junction" collection in the 1866 Christmas edition of All the Year Round. The railway signal-man of the title tells the narrator of an apparition that has been haunting him. Each spectral appearance precedes a tragic event on the railway on which the signalman works. The signalman's work is at a signal-box in a deep cutting near a tunnel entrance on a lonely stretch of the railway line, and he controls the movements of passing trains. When there is danger, his fellow signalmen alert him by telegraph and alarms. 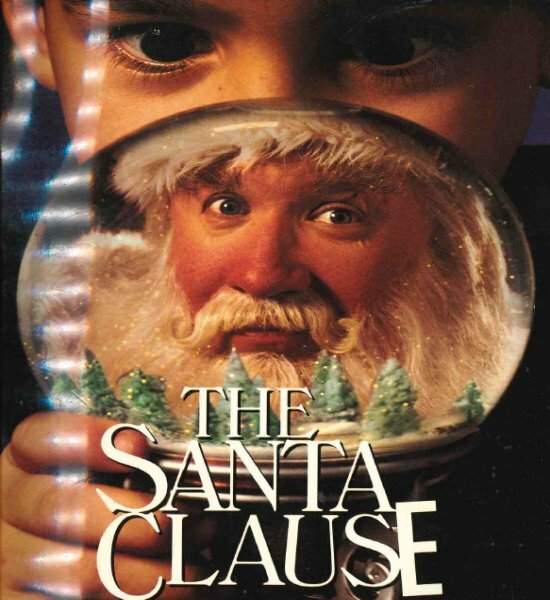 Three times, he receives phantom warnings of danger when his bell rings in a fashion that only he can hear. Each warning is followed by the appearance of the spectre, and then by a terrible accident. To Be Read at Dusk finds its first-person narrator amid the Swiss mountainous region of Saint Bernard, eavesdropping on a nearby group of men while avoiding the boring conversation of fellow travelers indoors. The sun is setting, giving way to strange thoughts and memories. The group is composed of five couriers from different nationalities, sharing instances of déjà vu, of omens and visions that mysteriously come true. As their stories co conclude, the couriers vanish leaving the narrator admitting that what he has heard has rendered him afraid of being left alone in such a place or in any other place. THURSDAY, December 27th, 2pm at The Dickens Project: GHOST STORIES! We take a different path at The Dickens Project, sharing ghost stories from a number of authors whose names are NOT Charles Dickens. Elrik Merlin presents two selections from the work of English novelist Alan Garner: the Arthurian fantasy Tarn Wethelan, and The Smoker. The author is best known for his children's fantasy novels and his retellings of traditional British folk tales. Much of Garner's work is firmly rooted in the landscape, history and folklore of his native county of Cheshire, North West England, being set in the region and making use of the native Cheshire dialect. Caledonia Skytower presents M.R. James' 1925 short story A Warning to the Curious; the tale of Paxton, an antiquarian and archaeologist who holidays in "Seaburgh" and inadvertently stumbles across one of the three lost crowns of Anglia, which legendarily protect the country from invasion. Upon digging the crown up, Paxton is stalked by its supernatural guardian. Presented live on stream in Dickens Square. 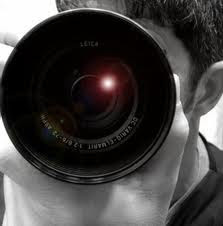 Time for us to take a broader view, in this well of time between Christmas and New Years. 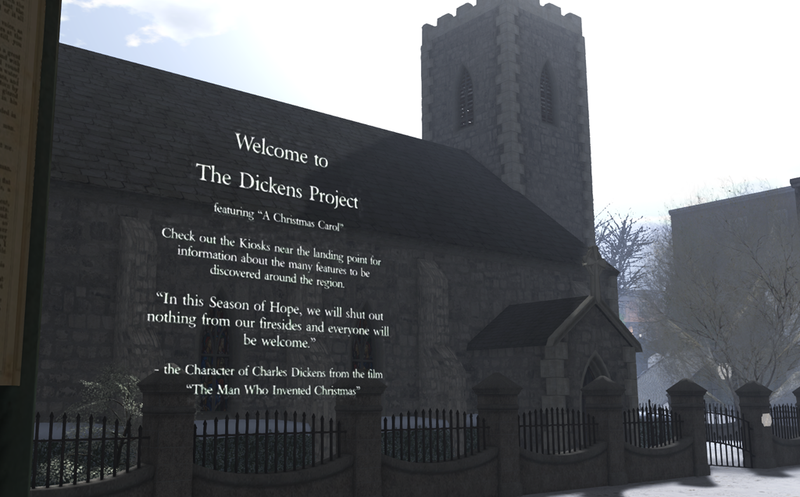 For the last five days of The Project, we'll be presenting a wide variety of things - not just Dickens! From 1-3pm: THE URCHIN EXTRAVAGANZA: music, dancing, parade, and frolic with Aoife Lorefield! All are welcome! Look for the short cut teleport at the main landing point. HAPPIEST & BEST from Seanchai Library! It has been an amazing, event-packed year - our tenth! Everything from our Volume 10 Celebration, to Fantasy Faire, to Tea Time on the Orient Express, to Frankenstein, and of course The Dickens Project. Our thanks to each and everyone who was a part of it, whether as presenters or appreciators enjoying the stories. 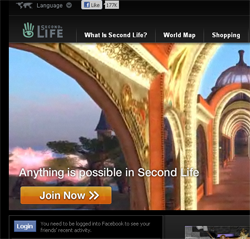 Together, we bring stories to life in virtual worlds. 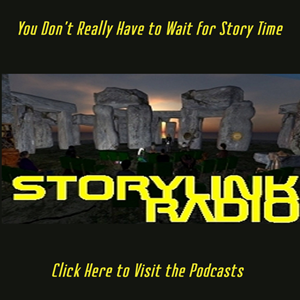 We have more tales and adventures waiting in the New Year: ancient Polynesian journeys, the creation of Time and, of course, a return to the Laundry Files. Join us, and bring a friend. It's BIG READ Day at The Dickens Project! "I have endeavoured in this Ghostly little book to raise the Ghost of an Idea which shall not put my readers out of humour with themselves, with each other, with the season, or with me. May it haunt their house pleasantly, and no one wish to lay it." Their faithful Friend and Servant, --C. D.
@11 AM - WALD SCHRIDDE Live in Dickens Square! Delightful 19th C instrumental selections perfect for the season. 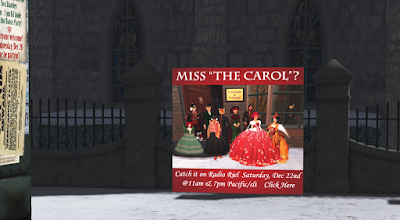 @ NOON - THE BIG READ: A Christmas Carol. The whole thing, soup to nuts, in one tag-team-relay story session. We begin at the beginning and when we get to the end, we stop! At The Dickens Project Today! @ 2-4pm in the Christmas Past Docks - FEZZIWIG'S BALL, Music with DJ Dano Bookmite - No one throws a party quite like Old Fezziwig! Come along and dance like it's 1812! Here's another opportunity to enjoy it. Radio Riel Main will be broadcasting the Radio Riel Player's production of A CHRISTMAS CAROL, adapted by Saffia Widdershins, at 11am & 7pm slt. You can Listen In, or visit LEA 7 for the 7pm broadcast and an impromptu tour lead by Caledonia Skytower of locations appropriate to the Radio Riel production. "... and it was always said of him that he knew how to keep Christmas well, if any man alive possessed the knowledge. May that be truly said of us, and all of us!" Two readings at two different times, live in voice, all times slt. Look for the big red carpet in Dickens Square for the starting point of the session. "The Phantom slowly, gravely, silently approached. 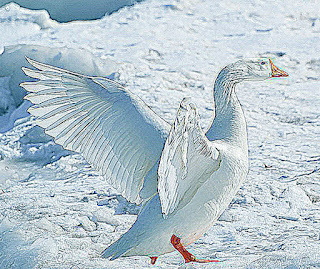 When it came near him, Scrooge bent down upon his knee; for in the very air through which this Spirit moved it seemed to scatter gloom and mystery." * NOTE: this time has been adjusted from the original posted schedule due to changing circumstances. Our apologies for any inconvenience. 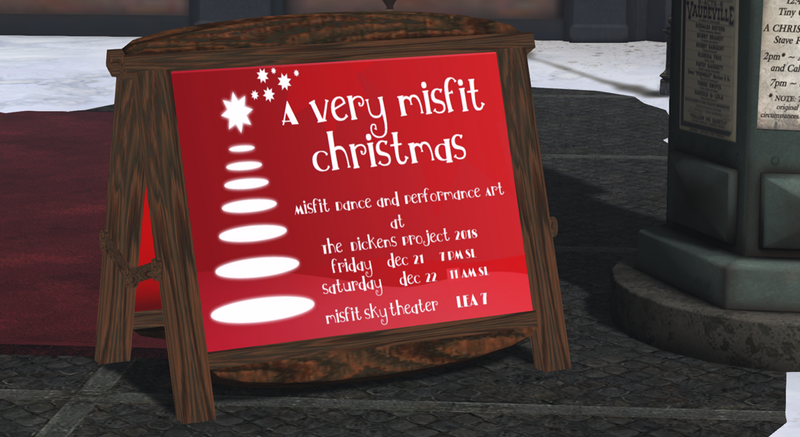 WEDNESDAY, December 19th at THE DICKENS PROJECT: Stories, Music, and Wootmas! More to see and do at The Dickens Project Today! "Awaking in the middle of a prodigiously tough snore, and sitting up in bed to get his thoughts together, Scrooge had no occasion to be told that the bell was again upon the stroke of One. . . ."
Three Great Opportunities to Enjoy The Dickens Project Today! The Poet Laureate of Ce Soir Arts offers excellent music and outstanding prose and poetry that is especially selected for reading at The Dickens Project. 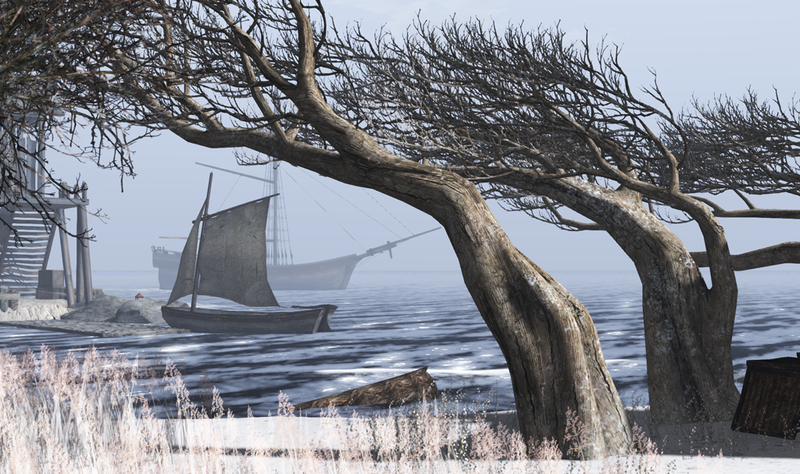 Victorian poetry and song will mark the hour with wintry magic. Come gather in Dickens Square with friends and enjoy in this lovely atmosphere! Russell Eponym, live on Stream. "When Scrooge awoke it was so dark, that, looking out of bed, he could scarcely distinguish the transparent window from the opaque walls of his chamber. He was endeavoring to pierce the darkness with his ferret eyes, when the chimes of a neighboring church struck the four quarters. So he listened . 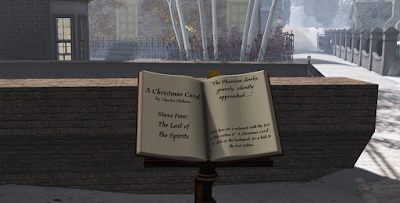 . ."
Carol Week continues at The Dickens Project as Scrooge conjoins with the promised Spirits on his journey of redemption with the These readings will be presented as Story Tours, visiting the locations on LEA 7 that have been created from the novella's inspiration. A new set of free Victorian Gowns in the Dressmakers' shop on Dickens Square. Not sure what to wear, ladies. Stop by for a simple, but elegant, addition to your virtual wardrobe! Courtesy of our own Aoife Lorefield. Collect these free gifts and more, found throughout LEA 7 as part of The Dickens project 2018 Edition, produced by Seanchai Library. "Marley was dead, to begin with. There is no doubt whatever about that. The register of his burial was signed by the clergyman, the clerk, the undertaker, and the chief mourner. Scrooge signed it. And Scrooge's name was good upon 'Change for anything he chose to put his hand to. Old Marley was as dead as a door-nail." 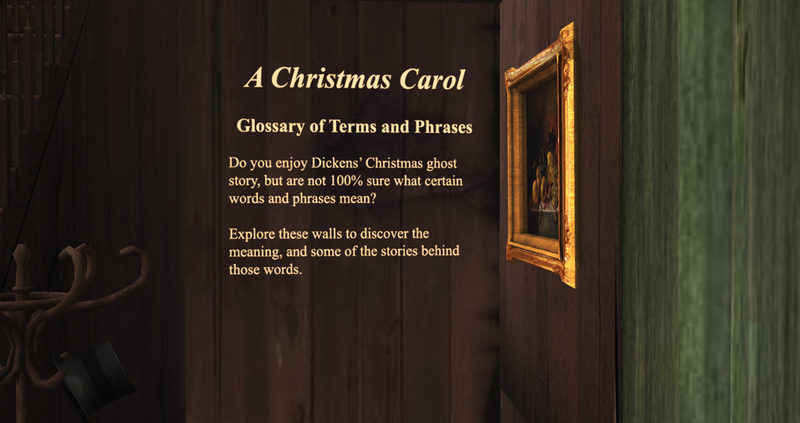 Carol Week commences at The Dickens Project with the beginning words of Dickens' great Christmas ghost story. These readings will be presented as Story Tours, visiting the locations on LEA 7 that have been created from the novella's inspiration. Do you sometimes find words and phrases in "A Christmas Carol" that you don't quite understand? 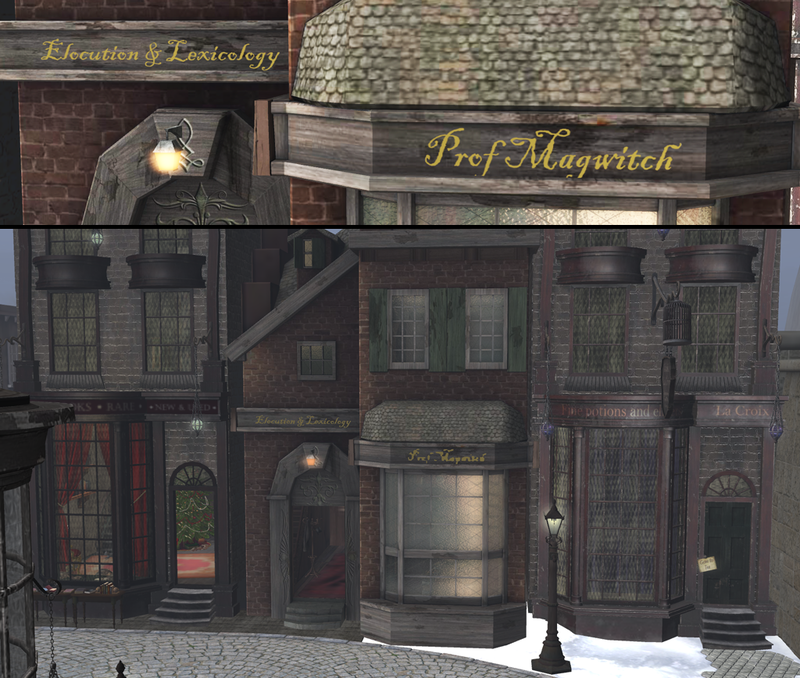 Visit "Professor Magwitch - Elocution & Lexology" near the Market Alley on the West side, where a glossary of words and terms is literally written on the walls. It's CAROL WEEK at The Dickens Project. 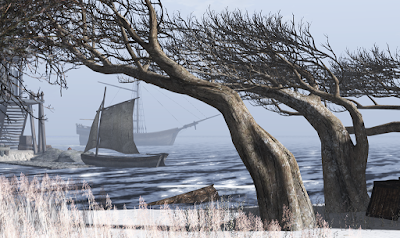 All our events will be taking place on LEA 7, including Story Tours, and some fun special events. Stories in voice unless otherwise noted. Schedule subject to change, because that is just how life rolls sometimes. Idle Rogue Productions presents a creative program of quality, original dance performances inspired by the life and works of Charles Dickens, with a little Steampunk and Women's Empowerment thrown in for delicious spice. All of it performed live in Dickens Square. Post Show Dance Party at 8pm. When Santa Claus accidentally tumbles off their roof, Scott Calvin and his son, Charlie, don't know what to do, until they find a small business card in Santa's pocket that reads: "If something should happen to me, put on my suit. The reindeer will know what to do." So Scott and Charlie take off on an amazing adventure in Santa's sleigh, delivering gifts and spreading cheer. But little do the Calvins realize, once you're Santa, you're Santa for life! Ktadhn Vesuvino presents an original story . . .
You have a task that needs doing. Without thinking much about it, you pick up some tools and use your skills to complete the task. Now... imagine making a New Thing. Ignorance is the beginning of wisdom. You reach for a tool... and it isn't there. What do you do? "Competing with Time" looks at the beginning. Where do tools come from? What leads to their design? There's a road trip and participating in a sand sculpture contest, along with exploring ideas. And... there are cats. What can you expect from a DJ whose name resembles the name of a mountain? Ktadhn Vesuvino does indeed have a sturdy sense of the music he chooses, and a constant desire to take a long view of things - his is the road less traveled, and it really does make all the difference. So if you have never had the pleasure of hearing one of Kt's sets before, be prepared for eclectic, thoughtful music, assembled in a musical journey that (he always hopes) speaks for itself. Grab a friend and join us in Dickens Square from 1-3pm slt, live on stream. TUESDAY, December 11th @ NOON at THE DICKENS PROJECT: Russell Eponym Live! especially selected for reading at The Dickens Project. Victorian poetry and song will mark the hour with wintry magic. Come gather in Dickens Square with friends and enjoy in this lovely atmosphere! Russell Eponym, live on Stream. end of this particular adventure. Caledonia Skytower returns to Baker Street for the story of The Adventure of the Blue Carbuncle, which first appeared in The Strand Magazine in January 1892. One December, Watson arrives at 221B Baker Street to offer Holmes season’s greetings and best wishes, only to find the Great Detective earnestly studying a battered hat. Holmes explains it had been delivered by commissionaire Peterson, who had witnessed a scuffle between some men, all of whom had run off, one of them dropping the hat and a Christmas goose in the process. Happy to let Peterson keep the goose, Holmes had found the hat to be of great interest, and by the time Watson arrives, had formed a quite clear set of deductions concern its owner, which he then proceeds to relate to the good Doctor. 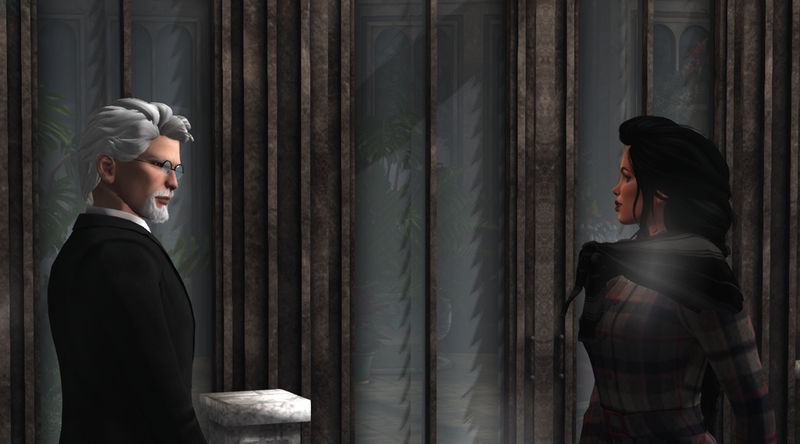 Their conversation is interrupted by the return of Peterson, who presents Holmes with The Blue Carbuncle, a priceless jewel stolen from the hotel suite of the Countess of Morcar a few days previously. Peterson explains he found the jewel inside the goose. 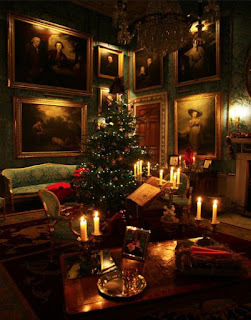 Having been quick on the case at the time of the theft, the police had already arrested known felon John Horner, who had previously been seen in the Countess’ suite cleaning the fireplace, and charge him with the theft. But Horner had from the start protested his innocence, and the police had been unable to locate the jewel, leading them to believe it is in the possession of an accomplice. So could it be that the man who dropped the goose and hat was Horner’s mysterious accomplice, or is something else going on? And why hide the jewel in a goose? For Holmes and Watson, the game is once again, very much afoot! Live on Stream. 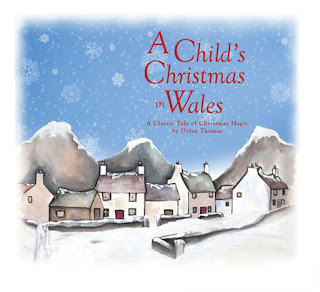 Aoife once again visits the sea-town corner of Dylan Thomas' memory to share the cold and headlong moon, the lynx-eyed cats, the fire, the bat-black, snow-white belfries, and finally the close and holy darkness of this perfect Christmas. This and some poems of the season, for an evening's celebration. ~ 1pm - TEA TIME with Charles Dickens - Selections from David Copperfield, Great Expectations, Nicholas Nickleby, and Oliver Twist, live in Dickens Square, in Voice. ~ 2:30pm - DJ Elrik Merlin - Music and Dancing live in Dickens Square, on stream. *MONDAY, December 10th at 7pm: A CHILD'S CHRISTMAS IN WALES and other Holiday Favorites with Aoife Lorefield. 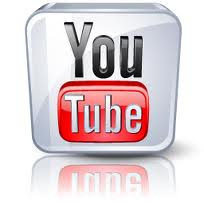 ~ at 1pm: DJ Ktadhn Vesuvino - Music and Dancing live in Dickens Square, on stream. 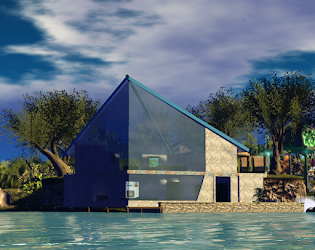 All sessions held at the Seanchai Library in Second Life unless otherwise indicated. Stories in voice. Schedule subject to change, because that is just how life rolls sometimes. 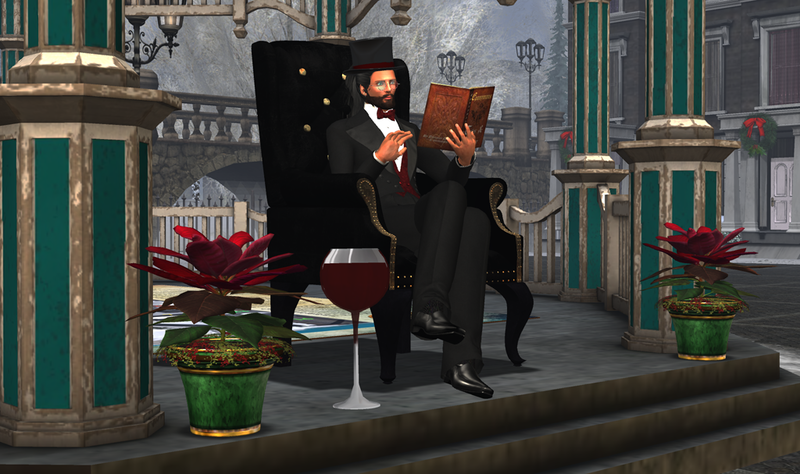 Join Aoife Lorefield, Da5id Abbot, Kayden Oconnell, VT Torvalar, and Caledonia Skytower for a wide selection from the works of Charles Dickens, including: David Copperfield, Great Expectations, Nicholas Nickleby, and Oliver Twist, live in Voice. Whether classic rock, celtic flavorings, classical compositions, or even bagpipes, DJ Elrik Merlin always delivers a set that is packed with fun and interest, adding his great knowledge of music and recording histories to the brew. 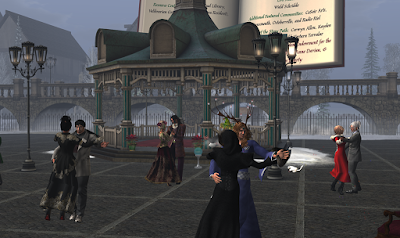 Come dance and enjoy today's journey in Dickens Square, live on stream. Then take a turn around the region on Bay Rum Royal, explore the shadowy corners of the Merchants Alley, or sink your toes into the ooze at the southern shore. Plenty to see and discover! Idle Rogue Productions presents an encore of the show that packed LEA 7 on Opening Day! 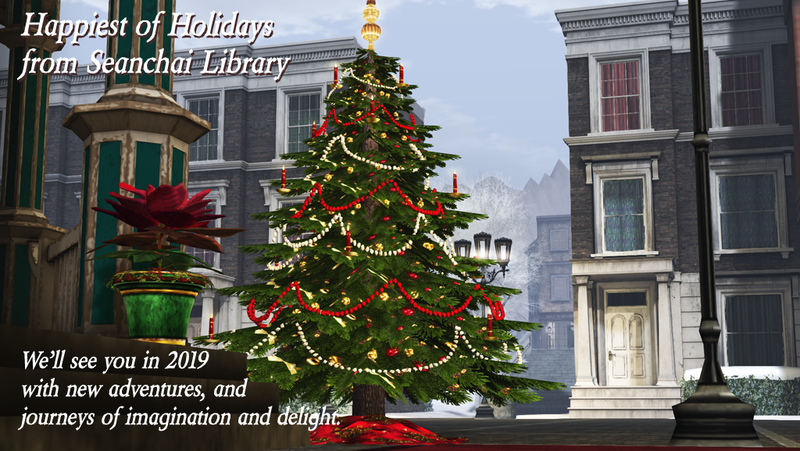 Victorian Christmas, Steampunk romp, and a whole lot of Woman Power! That's what this show presents, along with superb choreography and staging. There will only be one more opportunity to catch this show after today's performance. Come early: the first performance packed the region before half hour! 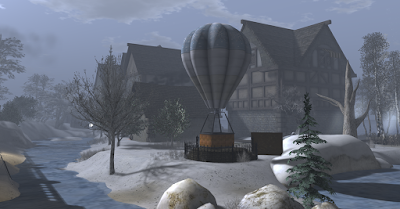 Then stick around to explore the region: take a romantic carriage tour or hot air balloon ride, collect gifts.